I’m a list maker…always have been. I like lists because they make me feel like I’m moving forward (or at least planning to move forward), and because checking things off simply feels good. Beyond liking lists, I need them to both remember the past (I jot down a “top 10” list after every trip I take) and frame the future (I keep track of everything from fleeting ideas to daily tasks to big picture goals to places I want to visit and people I want to meet). As a function of spending time at a computer during the day, I’m making more and more lists online (Evernote is my favorite platform for this), but I still prefer the old school ones I write by hand and tack up on my wall or chalkboard or fridge to see every day. I relate to the sentiment about letting go. For much of this year, I was playing with big business ideas — things that would have taken an immense amount of time and money and required significant sacrifices. When I let go of the frame that I had to do something major (try to start a world-changing company) in order to be “successful,” I was freed to do something that brings me fulfillment (doing work projects I care about, writing this blog, and simply living my LIFE). That’s not to say that I’ll never start a company (I still hope I can and will), but making the decision that it’s not what I want to do right now liberated me much more than it limited me. This is just a start (and sort of reads like a 5-yr-old’s list, right? ), but my gut says this list should be short and simple. I’m interested to see how this plays out of the next month or so. I’m admittedly skeptical because I’m wired to believe in vision and hope much more than limits, but I’m also open to the idea that putting a few guardrails in place about things to avoid might be helpful. What about you? 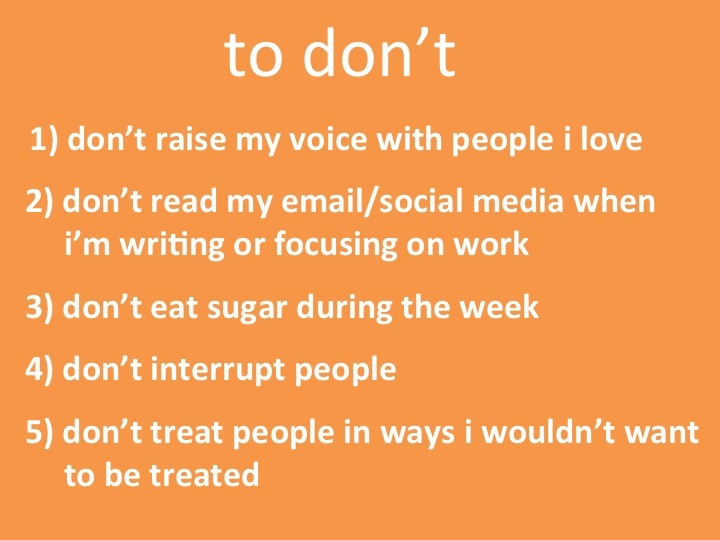 Have you tried making a “to don’t” list? Does it work? Does it change the way you think and behave?